Gluttony. That’s a thing of the past with foodies. Now, restraint is the new gluttony. Slow food. Locavores. Eating closer to the bottom of the food chain. Yeah, those are the subtopics of the current chapter. As someone who purposefully does not purchase many fresh foods grown outside California, I must confess to one weakness … bananas. Grown outside my entire continent, sprayed with various chemicals to control their ripening, transported half way across the world using oil that we … ok, let’s stop there. Simply put, I like ’em. And, my teenage son goes through them with like they are candy when he’s competing in one sport or another. 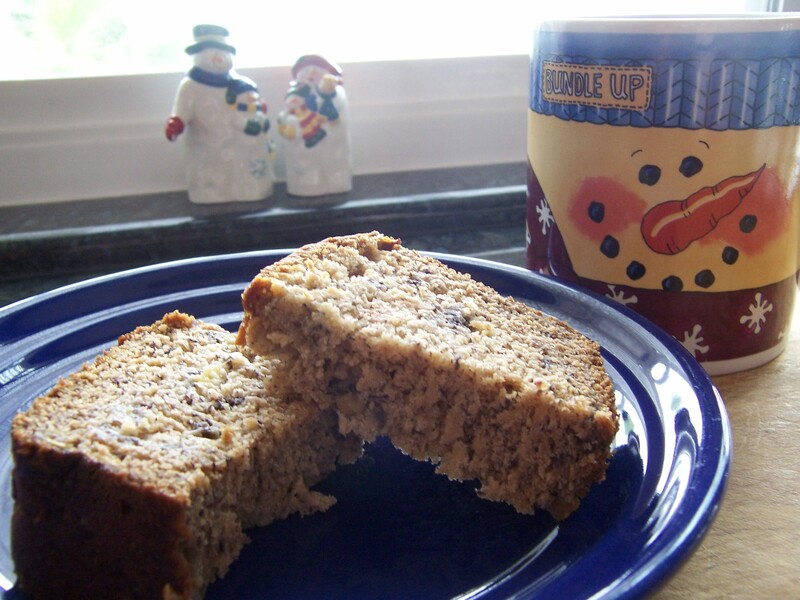 As for over ripe bananas, the obvious answer is banana bread! I found a recipe a few years back that did me well. Sure, it required 3 bowls and used shortening, but it was some pretty good stuff. When that big ol’ container of questionable shortening was finally finished (banana bread being its only use ’round here) I went on an expedition for a new plan. Ladies and gentlemen, I present to you banana bread made with 2 bowls and no questionable ingredients! This is straight from Allrecipes.com and incorporates several reader suggestions. Enjoy! In a medium bowl, combine flour, baking soda, salt, nutmeg, and cinnamon. In a separate bowl, cream together butter and brown sugar. Slowly add dry mixture until just incorporated. Stir banana mixture into flour mixture; stir just to moisten. Pour batter into prepared loaf pan. * Go ahead and mush those bananas between your fingers …. its fun! * When teen age kids are so excited over your banana bread and just pull the puffy top right off the loaf, take it as a supreme compliment. 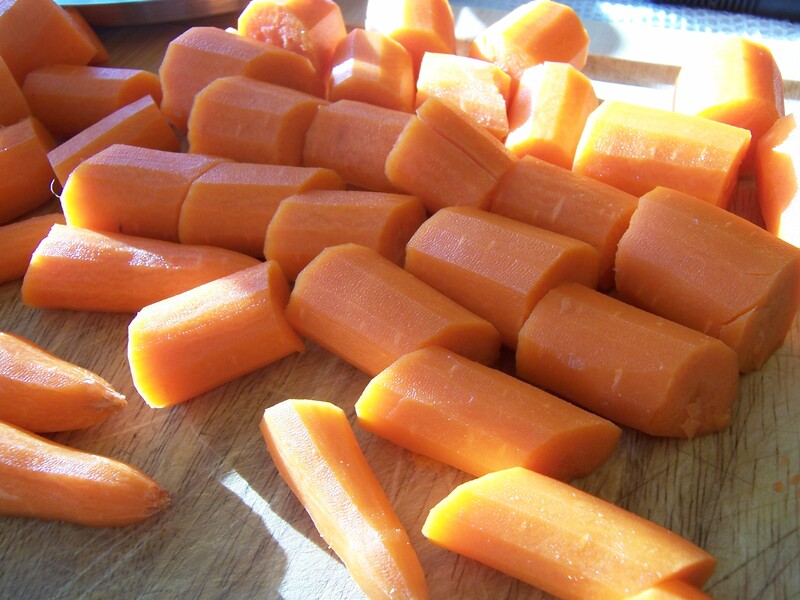 Carrots. Such a quiet, unassuming pedestrian root vegetable. For years I avoided these dependable roots that seemingly were just filler in other pedestrian dishes. Need a sturdy veg for a stir fry or curry? Add some carrots. Need some color in a quick salad? Add some carrots. But, if we wait for inspiration, and honor the carrot ITSELF, we find beauty. 1. In a large heavy saucepan cook onion, celery, and garlic in oil over moderately low heat, stirring, until onion is softened. Add carrots, ginger root, red pepper flakes, and broth and simmer, covered, until carrots are very tender, about 45 minutes. 2. Stir in remaining ingredients and in a blender purée mixture in batches (use caution when blending hot liquids). 3. Return soup to pan and heat over low heat until hot, being careful not to let boil. 4. 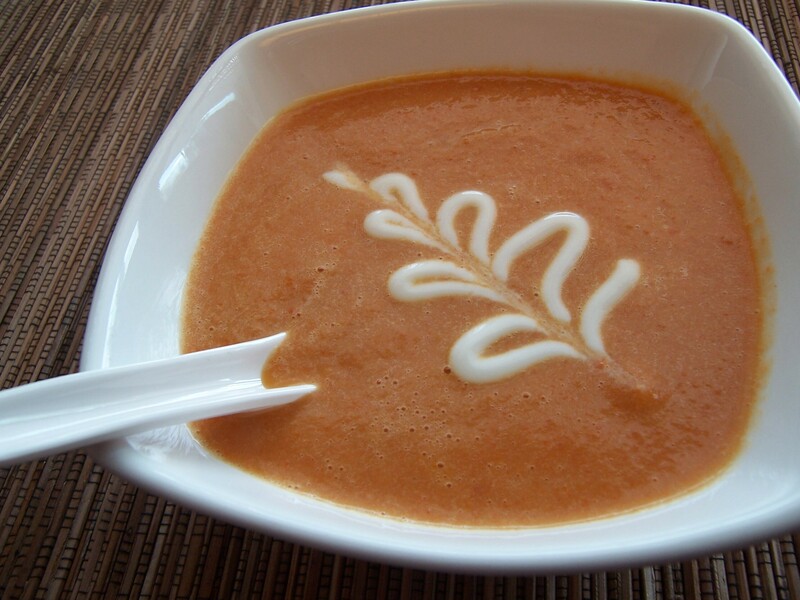 Serve soup drizzled decoratively with sour cream mixture. * If you are of the “double the garlic and peppers” persuasion, as I am, resist your first time through this one. That little bit of red pepper truly does add quite a bit of pop to the soup. * To speed this up a bit, chop the first batch of veggies, and while they cook, chop the second batch. Since you don’t need to worry about any type of presentation here, those perfectly cut vegetables are just not needed. Enjoy the break! * The squiggly decoration is easily made by using a squeeze bottle. I know I’m not the only one with a story like this…. Yesterday, my husband told me there was a phone message from someone in Kaleidoscope. That is the cancer support organization that where I cook for families with cancer via the Krockpot Brigade. Immediately I thought, how sad that Mrs. M passed away; I think I’m scheduled to cook for them next week. The message was actually about a change in Thanksgiving plans. Hmmm, in my mind it all just didn’t match up. Something was wrong. Later that evening I received word that indeed Mrs. M had passed away that day. I had only met her once, but quite clearly, I KNEW what had happened. What a lovely lady, and her husband proudly showed me example after example of her craft work, glowing with pride at his incredible wife. How is it that we just know these things? Its summer time and the living is good. 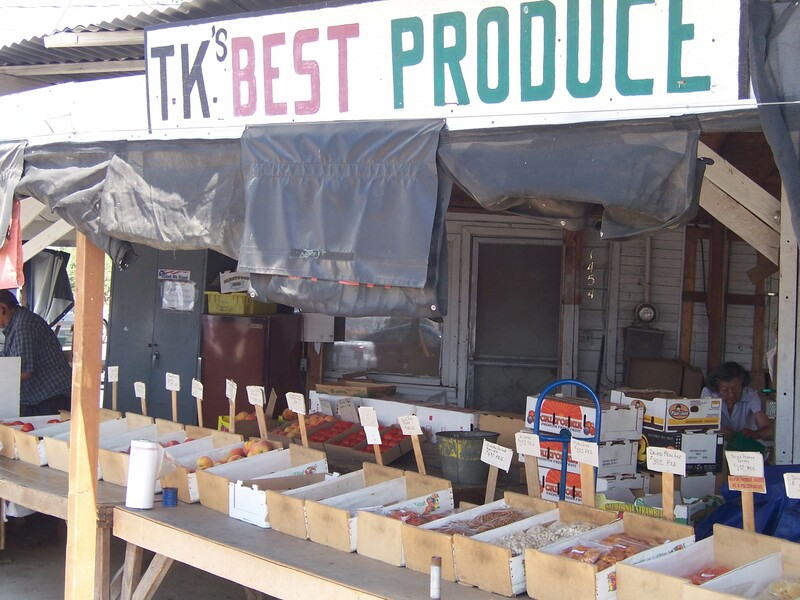 We’re continuing the simple life of easily prepared foods from the local farm stands. Smith Family Farm has an abundance of heirloom tomatoes and the question is just how to prepare them today. I ran across this gem at the epicurious.com site, tried the recipe as designed, and found true love. Ok, actually it was more like a crush on the first night when I did chill the soup a bit. It became true love after several more hours of refrigeration, with the cool flavors melding together in harmony. This clearly follows the mantra of “start with the best ingredients and don’t mess them up.” Enjoy! 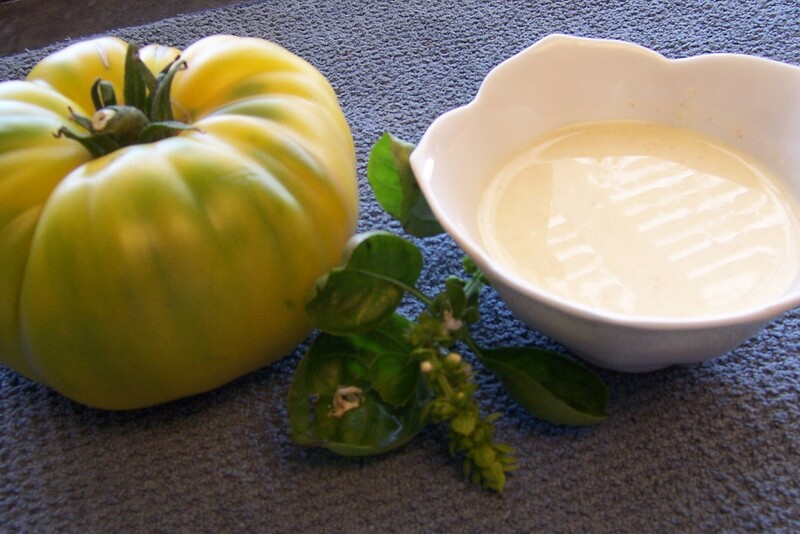 Coarsely chop tomatoes and purée in a blender with broth until smooth. Force through a fine-mesh sieve into a bowl, discarding solids. Whisk in cream, honey, vinegar, cayenne, and salt to taste. Quick-chill by setting bowl in an ice bath until cold, about 10 minutes. Seeing that I am in the “Ready for a Little Spice” phase of the Summer Squash Love Affair (see previous post), I made some yummy fritters with the squash kindly passed along by my neighbors. 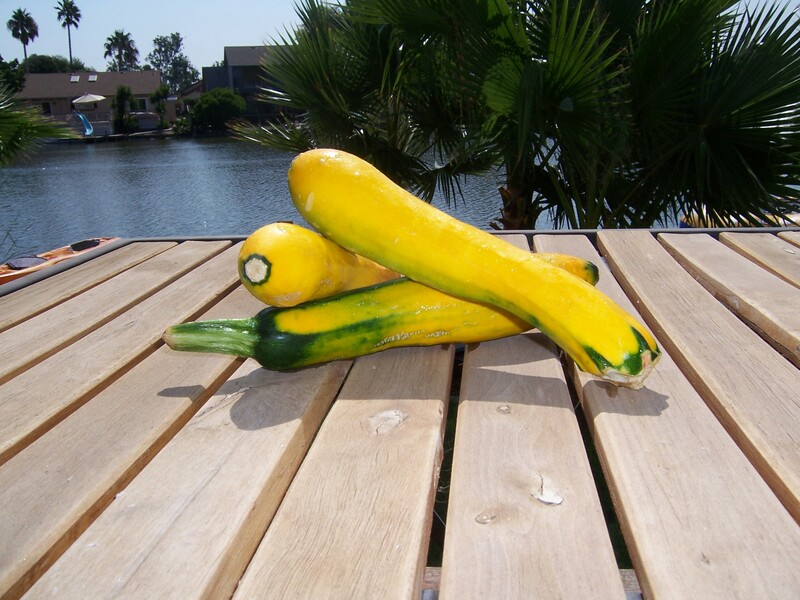 These can easily be made with zucchini, crook neck, or yellow squash. And their fried, and fried is good. The trick with making these fritters is to be careful with the amount of moisture. You want just enough to hold the fritter together, but not so much that they will fall apart in the oil or cause too much oil to splash on you. Adding to that is the lovely information that the squash are plump full of water. After grating the squash, you need to either lay out a few layers of paper towels and spread out the graded squash then cover with a few more layers of the paper towels. Some people have perfected the take a few layers of paper towels, or a clean dish towel, put the squash inside, pull up the sides tightly and squeeze out the moisture. It took me just one bad experience with that last one to go back to the lay it all out flat method. 1. In a large bowl, beat the eggs, then stir in the onion, cheese, garlic powder, paprika, salt and pepper. It should look like yucky baby food at this point. 2. Add the squash and 1/2 of the flour, mix gently. 3. 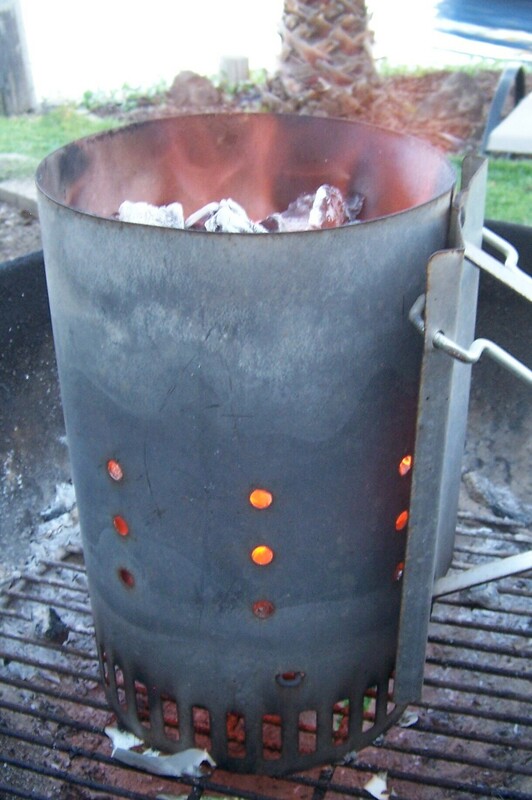 Cover and refridgerate for at least 20 minutes. Remove from refridgerator and drain any visible moisture. Add the remaining 1/2 cup of flour. 4. Pour oil into heavy skillet, about 1/2 in deep, and heat on medium – high. When the oil is hot, carefully spoon large spoonfuls of the mixture into the pan, and flatten a bit. (If you leave them too round / tall, the middle doesn’t cook through.) When the bottom is a deep brown, flip them over gently. After the other side browns perfectly, transfer them to a paper towel to soak up the extra oil. We served them with some Garlic dip from Primo, and the dip was much better with these fritters than it had been simply with chips.